I’ve waited so long for a villain as ridiculous as you. I love comics. You probably love comics. Comics can be dumb, comics can be breathtaking, comics can be both. Comics, especially superhero comics, have a tendency to run through their story really quickly, focusing on the plot instead of the characters, and leaving you feeling a little empty unless it’s starring your favorite character and you’re willing to do all the emotional and storytelling labor that the comic itself does not. So when I say Lex Luthor arrived in a very comic book-like episode of Supergirl I want you to be thinking of that last kind of comic. But I want you to also know that none of that matters because the last five minutes of the episode was so rapturously delicious peek Luthor. Seriously if you’ve been wanting to see a Lex Luthor that’s a cross between Gene Hackman’s campy smarm and Clancy Brown’s clever human supremacist than get pumped, because this man—who is still way too old to play the character—is pretty perfect. A lot was happening in this episode, and before I get into that last few minutes let’s go over it all. First, it’s actually not an episode about Lex Luthor, but one about James Olsen—even though he’s not on screen most of the hour. Last week he got shot in the back by a mysterious foe and this week he’s in the hospital clinging to life. Everyone briefly gathers to hold a vigil, before Supergirl and J’onn bounce. Leaving Alex, who is kind of friends with James, to keep watch with Nia/Dreamer and Brainiac who...I guess are also now friends with James? Dreamer spends the episode trying to make Brainiac feel better about being stuck in the past while they both waste time at the hospital doing nothing to help James, that guy they’ve met like three times. But then they finally smooch so who cares if they had no real reason to be there. Kara helps J’onn hunt down Manchester Black, who they assume shot James despite having little evidence of him actually doing it. (More on that in a little bit.) But Kara is, like, really, really bad at it. She gets frozen by Manchester Black in their first confrontation and then—because Kara is a dumb-dumb—she tries to shoot Manchester Black with her heat vision and instead destroys the dam that powers the city and will flood it if damaged. Not Kara’s best episode, but we do get a great scene where J’onn sees her and Alex as creepy zombies who taunt him with the deaths of his last set of daughters centuries ago. Zombie Kara and Alex are good. J’onn’s season-long struggle with Manchester Black is also pretty good, but more because of the work of David Harewood, who gives J’onn a measure of rage to go under that nice calm dad exterior. The arc itself has been messy and weird and never given quite enough time to be great, but also somehow given too much time. The important thing is J’onn finally stops Manchester Black—by just straight murdering him, and then I think he hides it from Kara? Or she pretends not to notice her father figure murdered a man after they’ve spent quite some time saying murder is bad? See?! The story has been a mess. Speaking of messes, big gay mess Alex Danvers meets James’ sister, Kelly, who we have never ever heard of before, and because the camera hung on Alex’s reaction to her appearance much longer than appropriate let’s just start assuming this is Alex’s new love interest (the actress, Azie Tesfai, was also made a regular for next season). Oh, and Alex convinced James’s sister to allow Lena to give him her black kryptonite treatment which may or may not have been a good idea. James—poor, poor James—wasn’t only a plot device this week. He was also a tool in Lex Luthor’s big to manipulate his sister. The episode starts with the siblings at odds in a flashback to that time Lex went crazy and tried to destroy the world and Superman finally stopped him for good. Lena is young and horrified by her brother’s grandiose madness, and when he shows up in the present, a few days from death and eager to make amends, she’s suitably suspicious. But then...then Lena returns to the mansion after James has been saved and accuses Lex of doing something to the power at the hospital and forcing her to apply the cure even though it wasn’t quite ready. And then Lex Luthor stands and yanks off his old sick man clothes to reveal a nice suite and is like “You idiot this was all to cure me of cancer. Thanks by the way,” and the weirdly mean U.S. Marshall that has been guarding Lex the entire episode turns off his little hologram device and is revealed to be Otis. And then Lex calls for Miss Tessmacher. You remember her right? The character that has been around for two seasons as the assistant of Cat, and then James, and the Lena? The lovable assistant who we all assumed had a name in a nod to the Donner flicks but was nothing like her Donner counterpart? Miss Tessmacher comes around that corner and is fully owning her look as the evil and nefarious right hand of Lex Luthor. We’re talking gun. We’re talking good hair. We’re talking on-point black power suit. She is working a look and it is evil and to really make it very clear she is not actually on Lena’s side and pretending to be on Lex’s she murders another marshall and helps Lex knock Lena out. What follows is some nice wanton murder of more government officials set to classical music and Lex attempting to escape by helicopter, only to be spotted by Supergirl. It’s perfection, and the only thing that made it better was the trailer for next week, which promises the return of Russian Supergirl, complete with silly hats and accents and Lex Luthor monologuing about the evils of aliens. This right here is what I signed up for three seasons ago. 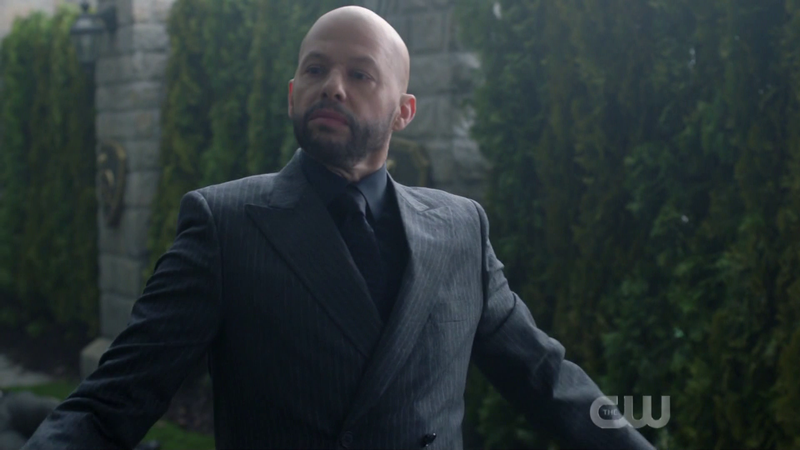 Lex had laser guns hidden in the Luthor family crest so he could murder government agents. You are a very extra villain Mr. Luthor. Alex calls out Kara for never being at the hospital, and it’s the first time Kara’s secret has actually affected her relationship with her sister (because Supergirl and Alex’s relationship doesn’t quite count). They finally gave a canon reason for Katie McGrath’s terrible American accent and it’s because her mother was Irish. Which I am now assuming means Lena was born and raised in Ireland. Like they didn’t even try to hide that Alex’s new girlfriend is James’s sister he has never talked about. The Jello metaphor was a real acting showcase for both actresses because they got through it without cracking up. There’s still no explanation for why Lex is so old, but I’m going with the kryptonite cancer” and I invite you all to join me.